Home » Academics » Schools » College of Arts, Humanities and Social Sciences » Faculty » Betsy Smith, Ph.D.
Betsy Smith, Ph.D., joined the faculty at St. Mary’s University in the fall of 2016. She earned her Ph.D. and master’s degrees in Political Science from Georgia State University and her Bachelor of Science in International Affairs and Spanish from Florida State University. 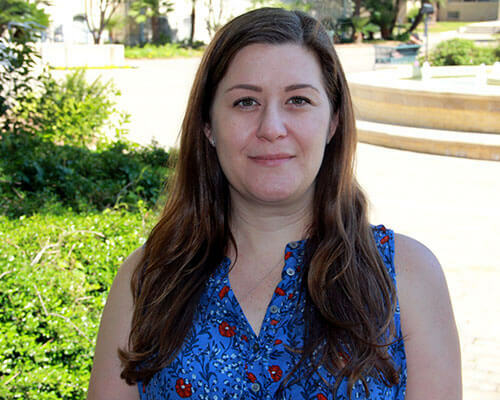 Her research focuses on democratization in Latin America and the responses to democratic crises by Latin American regional intergovernmental organizations, such as the Organization of American States (OAS) and the South American Community of Nations (UNASUR). She interned with The Carter Center in 2007 and accompanied an analyst to Ecuador to gather information and offer assistance during a constitutional crisis in that country. As part of her fieldwork for her dissertation, she spent time in Washington D.C. and in Ecuador (Quito and Guayaquil) interviewing former presidents and ambassadors regarding their roles in democratic crises since 1990. Smith’s teaching philosophy focuses on the importance of how we apply what we learn. She is passionate about ensuring that students understand and apply the material they learn in the classroom to the “outside” world. It is not enough to just know about politics or “how things work,” but rather it is the application of knowledge to benefit the greater community that makes education, and life, meaningful.